A couple of the pitchers that you have already read about in our Twins Top 10 prospect series. One is known for a killer curveball. Today’s pitcher isn’t known for either of those things and yet he was likely the easiest choice to make when the front office was considering who to add to the 40-man roster in November. He is on the cusp of what many believe could be a long major league career. Find out today why Stephen Gonsalves finds himself securely among the Top 5 Minnesota Twins prospects. 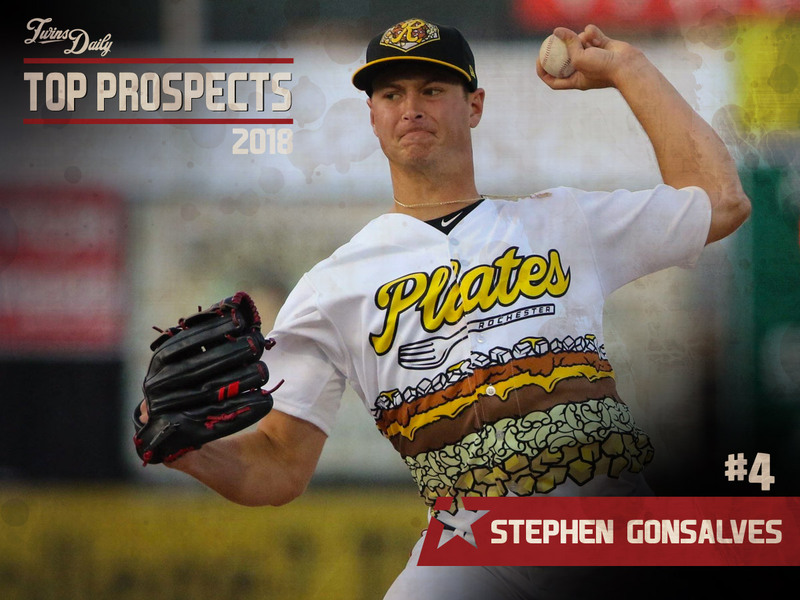 Stephen Gonsalves looks the part of a big league pitcher. The left-hander stands 6-5 and is lean, weighing in around 210 pounds, allowing himself to maintain his flexibility. He’s got a classic set up and delivery. While he may not throw his fastball in the upper 90s, once he got rolling in 2017, he was sitting 91 to 94 mph. Most of the time, he’s got pretty good control and command. Gonsalves is also said to have a plus-plus changeup. His smooth delivery and consistant release points make it a very effective pitch. What’s Left To Work On? At this stage, the still-just-23-year-old lefty is really just tweaking a few things in his game to prepare himself for the next step, the big leagues. He spent time this offseason working out with long-time major league veteran David Wells. “David Wells will help me out a little bit more to further my game, just being one of the older guys I’ve worked with. I’ve been working with Strasburg and Chris Young as well. So I’ve been able to lean on those guys a lot. I’m excited to work with David. He was one of those lefties. We all talk about how my curveball is slow and loopy, but he had one of those big, big loopy curveballs. So hopefully he can help me further that pitch so I can really get that fourth pitch down and I can come into this 2018 season with a bang. Gonsalves missed time in the Arizona Fall League in 2016, and midway through big league spring training last year, as he fought a shoulder issue which cost him the first six weeks of the season. But Gonsalves ended 2017 strong and looks to a healthy, full season in 2018. The pattern throughout Gonsalves’s career has been to start each season at the level he finished the previous, and he’s found benefit from doing that. That is likely what will happen again in 2018. With just three AAA starts under his belt, expect him to get at least a half-season with the Red Wings just to continue working on and tweaking a few things. Get to know more about Stephen Gonsalves and much more in the 2018 Minnesota Twins Prospect Handbook. The 2018 Minnesota Twins Prospect Handbook goes in-depth and provides player bios, scouting reports, statistics and much more on almost 160 Twins minor leaguers. I really want to see him force his way into the Twins rotation early this summer.Let's hope he puts up numbers like Liriano did all those years ago, at Rochester.The Twins could use someone to come up and be lights out! I am concerned about the recent trend of rookie starters for the Twins. This includes Kyle Gibson (10 starts, 6.53 ERA), Trevor May (9 starts, 7.88 ERA), Jose Berrios (14 starts, 8.02 ERA). Mejia's first 10 starts were OK (4.93 ERA). The only good recent rookie starter I could find was Tyler Duffey (10 starts, 3.10 ERA) and it's been all downhill from here. The Twins will have to be patient with Gonsalves... sophomore years have been much better for our starters. I seriously feel he is just another Tommy Milone 2.0.He has great stuff but just will not get any where in MLB.I don't know why, and i really hope i am wrong. Liriano had upper 90's heat and a wipe out slider. He still has the wipe out slider. Gonsalves will survive on the art of pitching, not on any one devastating pitch. Let's hope he gets good support from Twins catchers when he's called up. Nah, I get the feeling Gonsalves has a lot more natural stuff in his arsenal than Milone, who always walked a tightrope between success and disaster. Gonzo can bring reasonable heat in the low 90's. Milone was stuck below 90 most of the time. Who is the David Wells mentioned who was a long time “minor leaguer”? Having the young core of Berrios (#2), Gonsalves (#3), and Mejia (#4) and seeing them perform up to their talent levels would be huge for this team. Now if they only had a true ace. I’m not sure if / when this would occur, but having numbers 2, 3, and 4 in your rotation for 3 times the major league minimum (or 2 through 5 for 4 times) should warm the hearts of ownership. Maybe, just maybe, it would get them to look under their seat cushions to pony up for a true ace. I'm really hoping Gonsalves has a high floor and can stick around for quite a while in the middle-back end of the rotation.It's hard to expect a lot more than that from a pitcher who relies on control and some deception, and doesn't have the most filthy or overpowering of stuff.People have comp'd Gonsalves to Jaime Garcia, but I just don't see it.Garcia has a tight windup and release, and throws some loopy stuff.Gonsalves is long and loose and slings the ball, more like a poor-man's Chris Sale. But my favorite comp is to Jeremy Hellickson.Though Hellickson is a righty, watch the two pitching and you'll see that they have the same delivery and same approach to getting batters out.They have very similar minor league numbers.Hellickson was very successful his first two years in the majors, though his K/9 numbers dropped drastically in the majors from the minors.I think to be honest we should expect the same thing from Gonsalves.But if Gonsalves can stay healthy and pitch to an ERA in the mid to high 3's, he could be a big help to the team for at least a few years. I hope he's good. He might be their only hope this year. When I first read scouting reports on Gonsalves, all I could see was your classic junk-ball pitcher.With a fastball that's sitting around 91 to 94 mph, that's a pleasant surprise.Adding a cutter/slider is an excellent move. I don't like the return of Gibson at all.I'd like to see Twins management put Gonsalves in the 5 slot early this year. Unless he falls apart this spring - put him in the rotation.Give him at least until Santana comes back then send down if needed, but hopefully he will have proven his value by then.Good pick for #4.Now for Romero to advance quickly. I'm excited about Gonsalves. The makeup looks great, he's got the pitches to succeed, he just need more experience against higher levels of competition at this point. The velocity on the fastball doesn't concern me as much from a lefty; we've seen guys do just fine without needing the elite heat from that side of the plate (and its not like low 90's is slow!). If he can get the curve in shape as a useable 4th pitch hes going to have a nice arsenal to work with, and it'll give him options on a day where he's not spotting the slider/cutter as effectively. I love the changeup from him and that can be such an awesome offspeed pitch. Starting him in AAA makes sense, but I won't be shocked to see him up with the club by June. Agree that he is a different type of pitcher than Liriano.Doesn't mean he couldn't take another step forward and be as effective.The Twins have done so much right the past couple years with one of the most exciting lineups in baseball.Now we need to have a bit of luck with a couple pitchers stepping up big time. And what's all this talk of not having a true ACE.I believe that Berrios will become that.And I expect you all will also believe it this time next year! I've always been a bit skeptical of Gonsalves and his potential. He doesn't scream "ace", but the more I read about him I'm impressed with his makeup and attitude. Hopefully, he's got a lot more going for him than Milone (yikes!) and is closer to someone like a Greg Maddux who has great control. Let's give him a look-see soon! I appreciate pitchers like Gonsalves. He hasn't been able to get by on a 97 MPH fastball or a Wipeout slider throughout his life. He's had to learn how to adjust at every level, and so far he's been able to do it. I think it would do him a world of good to take things slow with him. I'd feel comfortable assessing the situation again after 15-20 more starts in AAA. Maddux had great control, he also had (with his catchers) a way of getting pitches well of the plate to be called strikes,I do not believe this will happen any more. When it comes to Twins starting pitching prospects, all we have is hope. Let's hope that first Berrios and now Gonsalves and Romero can become quality reality. If Gonsalves' changeup is that good, it will make 91-94 seem that much faster. Three quality pitches at three different speeds will hopefully make him an effective pitcher. I love our hitting and like the bullpen additions, but with our starting pitching there's still just hope. Tommy Milone wasn't so horrible such that an improved version would be so bad.Milone mixed speeds well which is more effective when you have a higher top speed.Hoping more for David Wells 2.0.I kind of like big loopy curve balls as long as they are more vertical than horizontal. I can't wait to see him with the Twins. Agreed.He seems to be a bit of a tall-framed bull dog out on the hill.I'd be fine with him building up some innings in Rochester, but I'd also be fine with him getting a shot as well.Give the 5 spot to the best player who earns it. Looking out at our pitching prospects, I like Gonsalves & Romero being towards the top.It's nice to know we have guys coming up who can contribute past these two, instead of coasting by on random free agents and fillers.I respect how hard Gibson has worked, but I'd love for someone new to come in and finally give him a run for his money too.Our rotation needed a revamping and we're getting closer to seeing that happen. We can save one of his minor league options by simply bringing him north with the big club. Let's see ...Berrios is going to be a true ACE, Gonsalves has hope of being close to Greg Maddux and we should advance Romero quickly after he petered out at about 100 IP last year .... Can we start branching the comment threads?One branch for fantasy and one for reality. He is a guy that has started the year the same place he ended the year before and now we are going to give him a shot in the majors, doesn't that seem like the Twins would be setting him up to fall flat on his face, so the first 5 years in the minors seemed to work really well, but lets change what has been working? Romero has been in the minors since 2012 (yes I know he had TJ) but at this point I don't think you can consider anything he does as advancing quickly IMO. I would love for Berrios, Gonzo and Romero to be our Maddux, Glavine and Smoltz or something even close but we all need to temper our expectations a bit on when this is going to happen. Remember a few years ago when the Mets had a rotation of pitchers with maybe the greatest stuff every (Smoltz said himself they were better then the Braves top 3/4) and how has that worked out? While very different pitchers, I always liked Berrios and Gonsalves both for their demeanor and reported work ethics. They both have that bulldog in them, and both seem to really grasp the idea of pitching, not just throwing. Both of them, at various stops, hit bumps before learning to make adjustments and then take off at that level. Just how good Gonsalves will be is yet to be determined. And I'm sure there will some growing pains, lime with most young pitchers. But I am a believer. Gonsalves sort of reminds me of a softer throwing Madison Bumgarner.If he can be 80% as good as MadBum I think all Twins fans will be very happy.